Amazon has over 310 million active users and growing. Our expertise managing both organic & paid Amazon advertising services has built an arsenal of proven strategies. Along with high performance, accounts and campaigns are designed to ensure sales at the lowest possible ACoS and ultimately put your products in front of the greatest spreads of potential customers. The guys at Pure Digital are talented and have a real passion for what they do. The end result is a real effective passion for you and your company's goals. We often consider them part of our team, not a 3rd party agency. For proper management, we break out our campaigns by Category, Criteria, & Targeting (Automatic or Manual). Ad groups are broken out by criteria and match type, since each match type performs differently. Each keyword will be duplicated in all 3 match types – exact, phrase, & broad. This guarantees that all possible search queries are captured and maximizes opportunities for optimization. It is considered proper practice to run both Manual & Automatic Targeting Campaigns at the same time. Automatic Campaigns will harvest new keywords to be added into the Manual Campaigns. The idea is to catch all of the hanging fruit, especially if it is bringing in sales at a low ACoS. Search Query Reports contain all of the search terms your ads showed up for in your Automatic & Broad Targeted campaigns. SQRs allow you to add profitable keywords into your Manual Campaigns, which should be done on a weekly or monthly basis, depending on traffic. This uncovers the search terms that will trigger your ads, tightens control on bidding, and monitors performance with the utmost accuracy. Optimizations should be performed on a campaign by campaign and keyword by keyword basis. Keywords with high ACoS should be optimized by checking which search terms they are triggering and adding negatives to decrease irrelevant traffic and spend. When the latter proves ineffective, this tells us the keyword should have its bid decreased or be paused in order to shift budget to higher performing efforts. Product content is one of the most important aspects of Amazon listings because it determines how Amazon ranks your products. With the proper content, you will dramatically increase the likelihood of your product showing up for relevant searches. We provide recommendations and comparative analyses on improvements that can be made in your Enhanced Brand Content. Structure is pivotal to performance and growth for any Sponsored Product or Sponsored Brand account. We’ve designed a structure with proven results, regardless of whether it’s implemented to a single campaign or your entire account. Its various elements include competitor analysis, option targeting, reporting needs, and overall goals. This structure ultimately optimizes management and increases efficiency without compromising capacity for growth. All successful Amazon Sellers must leverage the advantages and disadvantages of Automatic & Manual targeting available in both Seller and Vendor Central. Success in this area depends on the manager’s ability to properly structure the targeting methods and use the accumulated data to make the correct optimizations. Amazon’s AI extends the reach of your keywords and enables you to bid up on keywords by over 900% to reach the top of search or product pages. You can even use AI to bid on complementary or substitute product pages. We believe every Amazon campaign should include an AI-driven automatic campaign with dynamic bidding, which gathers crucial performance data. Once queries are analyzed, we can consult this data to determine how aggressive our next bid adjustments need to be. Search Query reports allow managers to analyze what their customers searched in order to find their products. This applies to all Automatic Targeting, as well as queries triggered by Manual keywords you are bidding on. You can then add these search terms as keywords or negative keywords to maintain 100% control of the campaign. Content plays a major role in Amazon’s ranking of your listings as well as hidden Quality Score. Your ranking determines how often your listing is entered into an auction and is eligible for the “Buy Box.” Improving the quality of your content also has proven to increase conversion rates, which confirms the necessity of “Enhanced Brand Content” whenever possible. Pet Wellbeing wanted to increase brand awareness and sales on the Amazon platform. The company was already entering a crowded space with well known-competitors and was suffering from high ACoS in their existing campaigns. Goals were established for increasing revenue & decreasing ACoS. What is included in the free Amazon account review? How long does the complimentary Amazon account review take? Do you manage both Sponsored Products & Sponsored Brands? Do you manage only Seller Central accounts, or also Vendor Central clients? Do you provide your clients with weekly or monthly reporting? Do you provide the client with content and visual recommendations? 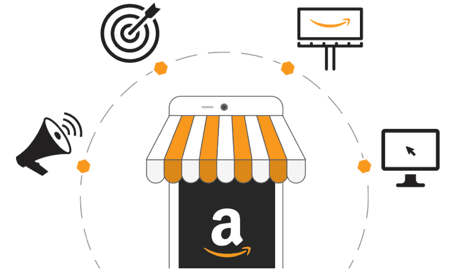 We do a fully comprehensive manual review of all of your current campaigns on Amazon and bring to the table our findings and recommendations, so you can see the value & knowledge we can provide to your brand. Our manual review of your account usually takes 7-14 business days. We then ask our clients to allow us 45 minutes to an hour of their time to present our findings in a PowerPoint presentation. Yes, we manage both Sponsored Products & Sponsored Brand campaigns in your amazon account. We manage both Seller Central & Vendor Central accounts. We are experts in both platforms and the different strategies & features that exist in each one. Yes, we provide our clients with as much reporting & data they desire. We even developed a process where we include all Amazon fees into your reporting, so you can get as an accurate as possible picture of performance. Yes, we have a team that does competitive analysis on product descriptions, visuals, and content to ensure your listings are fully optimized to rank higher on Amazon and increase conversion rates.